The Salinas Valley of California, southeast of San Francisco, is referred to as the “salad bowl of the world” because of its abundance of such crops as lettuce, broccoli, and peppers. And like many agricultural areas in California, the water supply is under stress from high usage, rising population, and changing weather patterns. Therefore, every water conservation effort in the valley contributes to the overall health of the vitally important agriculture industry. Recently the capacity of the Las Palmas, California, waste water treatment operations were expanded by combining two plants and making one centralized filtration center. The new center expanded the flow capacity from 162,000 Gallons per Day (GPD) combined to 288,000 GPD when the manually controlled reclaimed water operations were updated to a state-of-the-art automated system. Reclaimed water from the plant irrigates local community green spaces. The new automated system ensures lower labor costs, consistent quality, and peak efficiency in the process of reclaiming waste water for irrigation. And through this water conservation process the Las Palmas facility contributes to the overall sustainability of Salinas Valley agriculture through water reuse. To facilitate an effective transition from last generation to next generation technology, a turnkey/scalable system was sourced from Festo. under the direction of general contractor ERS Industrial Services, Fremont, California. Plant #1, with its capacity of 72,000 GPD, was built in 1989 in Salinas to reclaim water from the nearby Las Palmas Ranch residential development. In 1996, Plant #2 with a capacity of 90,000 GPD was built to accommodate soaring population growth. That growth continued and by 2009 additional capacity was needed. Plant #1 could accommodate higher GPD with an upgrade in technology, so ERS, with deep roots in the water filtration and treatment community, was hired as the general contractor on the expansion project. “Our goal from the beginning was to keep costs low and system performance high through technology innovation,” said Nik Radonich, project engineer, ERS. “One of the process innovations we thought offered the highest value was to find an automation supplier with the experience and expertise to design and deliver a complete turnkey control solution. We believed that one point of contact would speed communication and assign responsibility. We wanted one source thoroughly knowledgeable about the system to document, train, and provide support services. Finally, we were looking for automation system interoperability, where the majority of components were designed to integrate with one another. Figure 1. Close up of Festo Process valve, actuator, and limit switch assembly. One of the first things ERS did was to repurpose two treatment vessels no longer in service. These 5 foot diameter by 15 feet long horizontal vessels replaced four 5 foot diameter by 7 feet long vertical vessels. The horizontal vessels ensured more efficient/higher capacity operation. In the waste water reclaiming process, water is forced, under pressure, through a filter medium bed to remove the remaining suspended solids from earlier treatment before disinfection and final discharge. The filter bed is made of crushed anthra¬cite (hard coal) over crushed gravel. Each tank is separated into two compartments, for a total of four individual cells. The two cells in each tank share a com¬mon collector pipe, backwash supply valve, and effluent discharge valve. There are a total of 14 such assemblies, in different sizes, for managing the flow of water and air through the filter cells. The valve shown in Figure 1: is used to introduce air into the tank for pre-backwash agitation of filter media (air-scouring). By utilizing the air scour system the wash time was reduced 30%. Figure 2. Top, left to right backwash supply valve, effluent discharge valve, and back¬wash discharge valve. Figure 2: offers a close up of three different AWWA valve assemblies. All process valves, actuators, and limit switch assemblies were supplied by Festo. The effluent discharge valve operates proportionally with the help of a pneumatic proportional positioning valve and position feedback unit. This system allows the operators to set the desired flow rate. 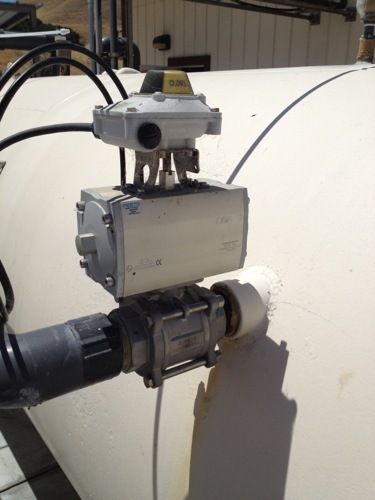 A magnetic flow meter provides feedback to the PLC, which uses a PID flow control loop to modulate this valve. There are two such valves in this system. Festo pre-assembled all process valve assemblies prior to shipment to Las Palmas. The Process Overview screen is the main control point for the filtration system. The overview screen provides a complete view of the entire process as a graphical representation with real-time instrument data, graphical animations, and touch-sensitive areas that are used for showing an item in more detail. For example, touching any of the valve, filter, or pump symbols changes the displayed page to one dedicated to the device. Flow Meter showing the flow in gallons per minute leaving the system. The 120VAC power supply and I/O connec¬tions to remote instrumentation and the pump control center are housed in an adjacent building. Tying this system into existing plant equipment required the close coor¬dination of ERS, Festo, plant personnel, and electricians working on site. The Festo CPX valve terminal assembly provides extensive self-diagnostics. Self-diagnostics ensures that hardware problems can be quickly identified with pinpoint accuracy. Screen icons provide a graphical representation of all modules in the CPX assembly. Trouble on any module is indicated by a red warning symbol. Touching the icon reveals more detail about the problem. Process data is also collected and saved for analysis. Festo designed this system to be scalable, which means that the same fundamental system can be designed, pre-wired, and assembled for different sized projects more quickly and with more assurance of success than building from scratch. 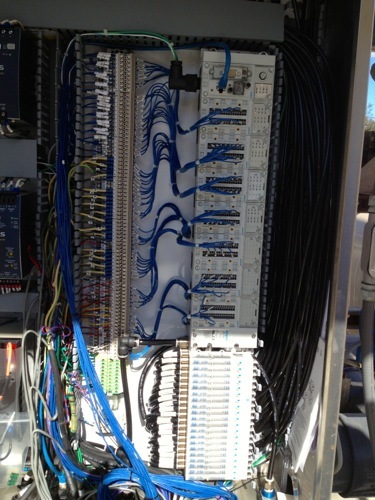 Furthermore, since the majority of components were designed to work with one another, operators are assured of peak interoperability. Operators report that the system performs to expectation and the information available from the control screens helps to ensure peak efficiency and faster problem resolutions with added diagnostic and test screens. Festo process valve, actuator, and limit switch assembly. Festo’s CPX/MPA product that allows PLC, I/O, and Pneumatic valve integration. Ethernet communication for simple programming, module library included. 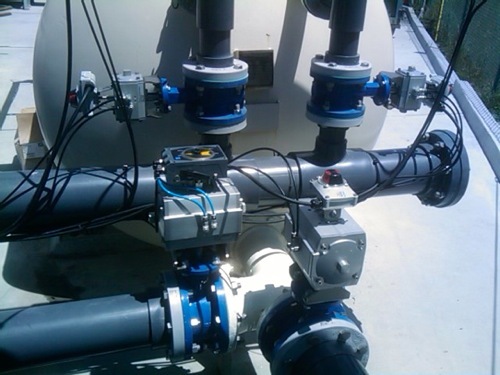 On board diagnostics with I/O and solenoid valves saves operators trouble shooting commissioning time. Bi-stable AWWA Process Valve, Pneumatic Actuator, and sensor box (Festo), 14 sets. Bi-stable Ball Valve Assy. (Festo), 4 sets.